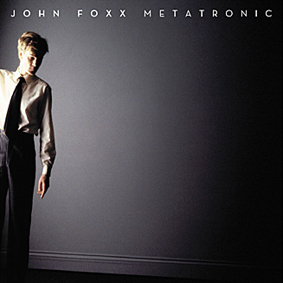 Metatronic, released in May 2010, is a three-disc set celebrating John Foxx's thirty years as a solo artist. It comprises a new compilation, a live album and DVD of selected videos. Metatronic disc one opens inevitably with "Underpass"; Foxx's biggest hit and best known track. This version however, is fresh from the vaults, and features a slightly extended coda. "This City" follows, and as the second track, it really gets the attention it so rightfully deserves. Although a b-side from the Metamatic era, "This City" totally encompasses the overarching theme of the album and Foxx's obsession for all things urban. "No-one Driving" and "Burning Car" wrap up the Metamatic tracks, before we fast-forward to 1997 and the Shifting City album, from which we have "The Noise" and the haunting "Everyone" - a surprising choice, but perhaps one of Foxx's more diverse tracks. So while not all the tracks on offer may be that well known, perhaps Foxx felt they deserved a second chance, or merely wanted to highlight their significance in the big picture, of which each album plays an important part. The tracks are at least presented chronologically by album, giving an overview of Foxx's discography. of Electricity, taking the listener back into the architechure and technology of Metamatic. Up next are the single edits of "Drive" and "Broken Furniture" from Crash and Burn, along with "Once in a While", which follows in the footsteps of "Everyone". We're then taken into 2006 with "From Trash" and "Never Let Me Go", and "Smokescreen", the only track present from Tiny Colour Movies. An odd choice perhaps, at least in terms of representing its parent album, but perhaps the most obvious, since we get to see its accompanying film on the DVD. finished in 2007, with one of Foxx's most fascinating lyrics and filmic scenarios. The surprising choice of "Phone Tap" follows, a track which strongly echoes Bowie and Eno's Berlin-era ambience, before we're back to 2003 and the often-forgotten "Smoke" to close the album. Phew! alongside the live albums A New Kind of Man and Neuro Video. different early version of "Burning Car", and Mark Reeder's excellent new and energetic remix of "Underpass". The subsequent remixes of "Dislocation" and "20th Century" add little and I suspect in my case, will remain unplayed. It is a shame that Jori Hulkkonen's original version of "Dislocated" wasn't included here. on the electronica side of things, in keeping with the rest of the set. Here we have two alternative films for "Underpass"; one being a new cut set to Mark Reeder's Sinister Subway Mix, the original videos for "He's A Liquid" and "No-One Driving" (cue neon tubes! ), excellent live versions of "The Noise" and "Shifting City" and officially available for the first time, "Smokescreen" from Tiny Colour Movies. Overall, Metatronic is not your typical money spinning 'best-of', but a carefully chosen set of songs which tells a specific story. Right down to the refreshing sleevenotes by lifelong fan, Garry Hensey, Metatronic actually feels like a celebration of the music of John Foxx, and becomes an album in it's own right.